Time for another quickie! I'm on a roll! 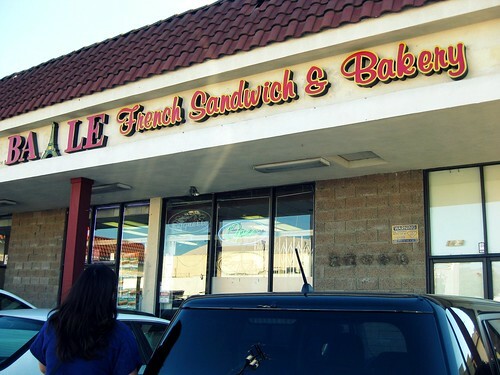 Glam, Giggles, and I went to Ba Le French Sandwich & Bakery (1426 S. Atlantic Blvd., Alhambra) after a failed attempt to get crepes elsewhere. It would take too long to explain the no-crepes story. I might do it another day, maybe when we finally eat at that crepe place for real. But back to Ba Le. It's a counter. No seats. And there was a duck on the ground. 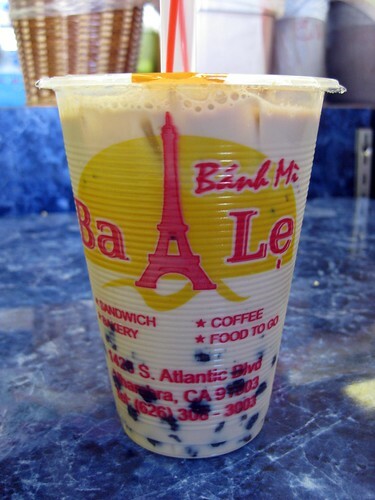 Here's my boba milk tea. 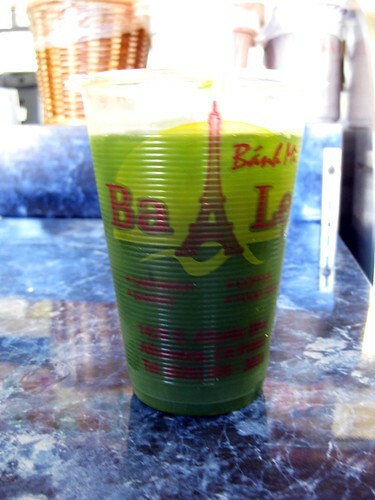 Here's Glam's weird green drink. My sip tasted awful. I'm still not sure what it was. Here's my barbecued pork sandwich. 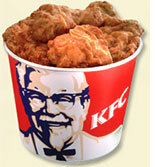 My lunch cost under $4.00. It also cost me an unexpected trip to the bathroom. the green drink might be pandan. 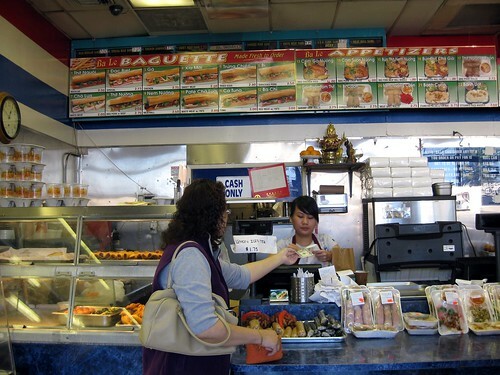 i can't remember the banh mi place that we loved in high school. my friend's mom would bring us lots of sandwiches from there, and it's somewhere near your office. so i was going to ask what this boba milk tea is that you often have, but instead of asking i decided to use the power of google...and wikipedia. and, OMG, does that drink sound yummy! one of these days (while on vacation) i'll have to try one! I love the vietnamese, but really, they should stick to vietnamese food. french food belongs to the french. not that I'm biased or anything. if you're jonesin' for bahn mi, bahn mi my tho down the street on valley & 4th is much better. Bah Le has gone downhill since the 90s. It's very sad. Ditto Daily Gluttony, Banh Mi My Tho is good. 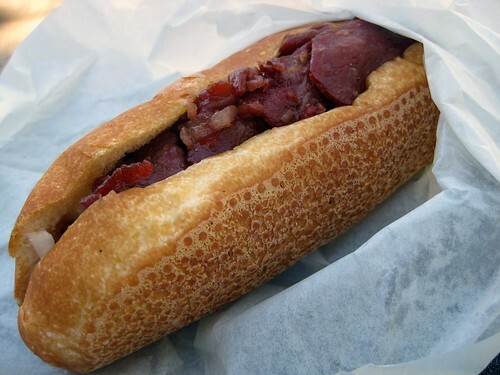 It's more of the traditional sandwiches unlike Mr. Baguette. The place is really tiny and no tables. Ewwww. I found the picture of the duck amusing though. see, i would've run screaming at the sight of that duck. 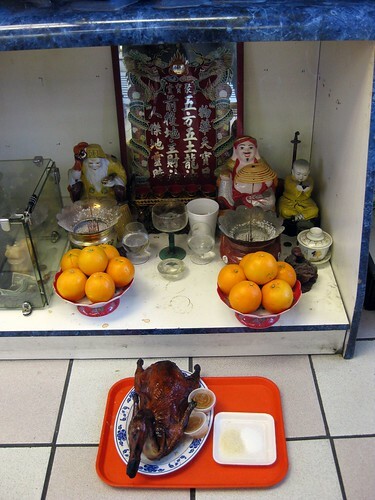 Ba Le actually has a few eateries on Oahu and Maui. At least I heard they're affiliated. The logo is the same. The ones on Maui are fabulous. I ate it every day I was on the island. When I came back and saw this one on Atlantic, I did a happy dance in my car, only to have the same disappointment you did. And I didn't have the entertainment of a duck on the floor. lol - what grade was it? Yea, the duck on the ground would have made me turn around and run out of there immediately. That place looks gross! Ick. what was the duck on the floor for? eek. and um yeah i don't think i'll be going there any time soon. thanks for the heads up. 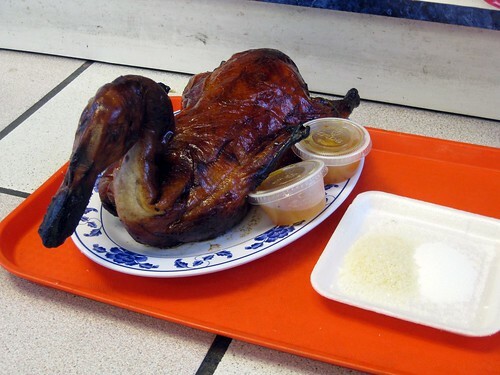 That duck mad me sad. wow, weemo, that duck is soooo bad. hahha. this is one place i won't be trying!! the green drink is called vietnamese pennywort or "rau ma"
Surprisingly, insom, it had an A! Thanks, Sarah, for the identification of the green drink!